Forum » SpaceEngine » News and Announcements » SpaceEngine 0.9.7.2 release! Hi, I am getting a crash whenever I load up a neutron star, black hole, or white dwarf. I suspect it is because of the gravity lensing effect. It persists even after I redownload and reinstall. I also got a crash when I stared into a white main sequence star while trying to eclipse it with a planet, but that might be unrelated. I have a Radeon HD 5870, it could be an issue with ATI cards. 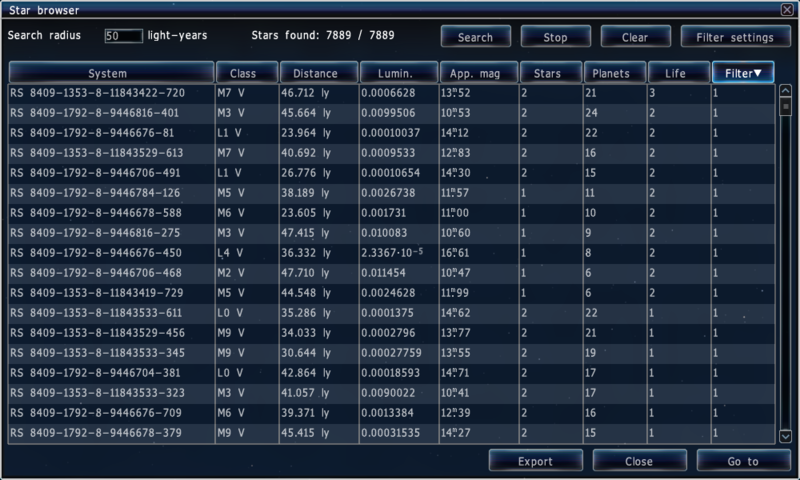 But the thing is, that the Browser shows me too much Star Systems, after i set the Filter... He doesn't show me ONLY the Systems that have, at least, 1 Terra with Life, like i preset it.. The last column in the browser is the filter column. It shows you how many worlds match the criteria you specified in your filter. You should sort the list using this column. vanguardmook, please read the OP of the troubleshooting thread. Typbürste, On the last column of the star browser (under ''filter'' tag) it lists the objects (planets, moons or both) that much the criteria that you have set in the filters menu window. It says: 0, 0, 0, 0, 1, 0, 0, .... in the column. Space Engineer suggested to you that you press the filters header (the column headline) so that it brings on top those systems that actually have the objects you are looking for - it doesn't mean that the browser will only return results for the systems that much your filter criteria. You have to look at the filter column to see which system actually have such filtered objects. My apologies. It didn't happen last version. It's still higher quality than the last version even with that setting off... so thank you for that. No accretion discs in this version? Okay, thanks to HarbingerDawn and n0b0dy, i will try that later at home. Right now, i'm at work, i'm reporting later. I finally got the SE 0.9.7.2 downloaded and running!! SE is just keep getting better and better!! Thanks for the release!! This new version of Space Engine looks even better than the previous one. I am not sure but I think the overall performance has improved. Thanks Vladimir you are doing an awesome job!. Is there a fix for oculus support? Whenever it is selected program becomes unresponsive. UPDATE : NOW FIXED ! Make sure you use your DK2 with SE in extended desktop mode.